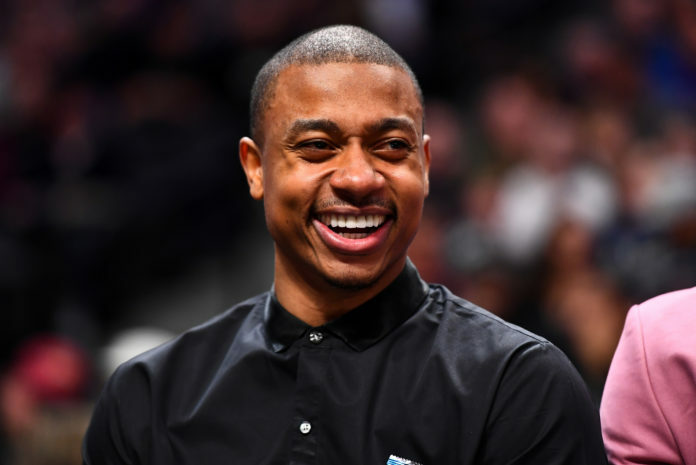 It has been just under one year since Isaiah Thomas last participated in a NBA game, but after more than 320 days of waiting, there are very real and legitimate signs that Thomas could return to the hardwood within the next 10 days. Over the past month, there have been a breadcrumb trail that has been admittedly easy to follow. Let’s go in chronological order, shall we? On January 19th, Adrian Wojnarowski of ESPN reported that Thomas could return during the Nuggets home stand on February 11th-13th when they face the Miami Heat and the Sacramento Kings respectively. Wojnarowski also noted that there is, “strong confidence that he will return no later than the first game after the All-Star break,” in the same report. As early as January 29th, Thomas began tweeting to the public that he was looking for a place to get some reps playing live five-on-five games. He continued to do so again and again as he continued to search for a place to take the next step in his rehabilitation process. 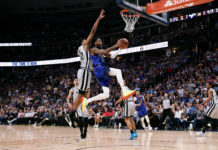 The reason that he was turning to the public to get time playing in a live game setting was because the Nuggets were so injured that they did not have enough healthy bodies to play five-on-five. 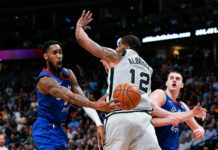 On February 8th, Shams Charania of the Athletic reported that Thomas had been assigned to the G-League for his, “next step toward imminent return.” Then, Adam Johnson of 2 Ways and 10 Days reported that Thomas was originally sent to the Delaware Blue Coats of the G-League, but that he was also recalled back to the Nuggets that morning. That is when Mile High Sports learned that Thomas never actually went to Delaware and that the original plan was to send him to the G-League for some practice time with the Blue Coats. The Nuggets still could not put together enough healthy bodies to allow Thomas the play some five-on-five basketball with his own team which is why the decision to assign him to the G-League originally came to fruition. Once the Blue Coats alerted the Nuggets organization that they also could not facilitate a five-on-five basketball game, it was decided that Thomas would instead stick with the Nuggets instead of heading down to the G-League for practice time. On February 10th, after an extremely rare practice day, Nuggets head coach Michael Malone told the media that Thomas went through, “a little bit,” of the Nuggets first five-on-five session they have been able to have at practice in months. All of these signs point to the fact that, of course and as always, Wojnarowksi’s reporting was spot on. Thomas is officially ruled out for the Nuggets’ Monday night home game against the Heat, but he does have a chance to play against the Kings in the last game before the Nuggets head into the All-Star Break. With Denver still dealing with extreme injury issues, Thomas’ return could be a sizable boost for the 37-18 Nuggets. Jamal Murray has been battling all kinds of injuries this year from spraining each ankle at different points in the season to being kicked in the shin so hard he appeared on the injury report with a shin contusion. Additionally, Gary Harris has sustained four separate lower body injuries throughout the season and has missed 23 total games (more on him later). Because of Murray and Harris’ injuries, the likes of Monte Morris and Malik Beasley have had to step in to play significantly larger rolls than they have ever played which has led to fatigue. That means that Thomas could return from injury and step right into a spot in the rotation…for now. Once everyone on the Nuggets roster gets healthy, there are still questions about where the Nuggets can carve out a consistent role for Thomas, but that is a problem to solve at a later date. What is important right now is that Thomas is finally returning to the floor after a tedious rehabilitation process. 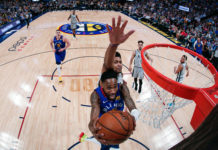 Will Barton, the Nuggets starting small forward, could not be more excited for what Thomas can bring to the table for the second-seeded Nuggets. When asked what Thomas can do to help Denver, Barton said, “A lot. Leadership, former All-Star, scorer, a guy who can close games, toughness, and he has been on the big stage in big moments. In addition to Thomas’ injury update, Malone also spoke on Gary Harris’ right adductor injury. Harris has not officially been ruled out until after the All-Star break, but it seems that decision could be made in the very near future. Even Malone believes that the best course of action is sitting Harris down for the next ten days to allow his body to heal. “No one has said that he is out until after the All-Star break, but in my mind, I am thinking that is the most prudent decision to make,” Malone explained at practice on Sunday afternoon. Frustration has begin to mount for Malone and almost assuredly Harris himself. The Nuggets have only had their original starting unit together twice all season and both of those games in the very first two games of the year. Now, Harris’ strained right adductor is keeping their starting group from being complete for the fourth time this season. This is Harris’ fourth lower body injury of the season after sustaining an left ankle injury in November, a right hip issue in December, a right hamstring issue in January, and now a right adductor strain in February. Those four injures has led to Harris missing 23 of Denver’s 55 games this season. Harris did go through portions of practice on Sunday afternoon, but the Nuggets are not going to force Harris to get back on the floor. Their approach when it comes to their injured players has not wavered. The first priority is getting their players completely healthy before bringing them back onto the court and Denver’s handling of Harris’ strained right adductor will follow the same trend.